“Hackney council are a miserable bunch of morons”: well, if the electorate there consistently votes for the Miserable Bunch of Morons Party, then Democracy works, dunnit? Next thing you know, the Miserable Bunch of Morons will justify their nitwittery by inventing some religious minority who are deeply offended by images of hares. Suggestion: a giant carrot painted on a house opposite. Exactly, dearieme. Perhaps they fear the little rabbit that protect the Holy Grial, remember? I am kind of ready to support Hackney council, because the alternative, where suddenly a mayor or one of his/her minions becomes an arbiter of artistic merit, is usually even worse. Maybe it’s all a surrealist joke. Hare today and gone tomorrow. The traffic laws? Killer bunny! run away, run away! And zoning, as in “We live in the Art Zone, darling”? I wouldn’t want Hackney council making art decisions any more than I’d want them sizing the beams for the new concrete flyover, I don’t care what party they represent. Or perhaps they think is offensive to carrots… and they have to take care of the sensitivity of the whole community. Oh well, when time comes to scrub it out, “Hare today, gone tomorrow” gets another run-out in the local rag. Aaaah, Julia, sorry, and I did a CTRL+F and everything to see if that joke was already there. And now I’ve apologised to Julia instead of dearieme. I think this flu has damaged me. I’m sorry you’ve got flu, Pin. Actually, “Next right after the rabbit” would be a useful traffic direction. ‘We don’t make the rules mate.’ No, but you can decide whether to enforce them or not, everyone knows that. There are lots of antiquated laws on the books that nobody bothers with. Officious arseholes. But, but, says the reactionary alter ego (who’s never far from the surface): if you put up a graffitti you’re saying, ‘Look at overpaid-gallerist-what-exactly-is-it-you-do me, aren’t I flaunting the rules of bourgeois society!’ So then you can’t complain if bourgeois society refuses to be charmed by your harebrained schemes. It’s a toss-up. Maybe the question should be whether it’s a good hare, or whether that wall would look a lot better with just the grey condensing unit hanging there in the corner. 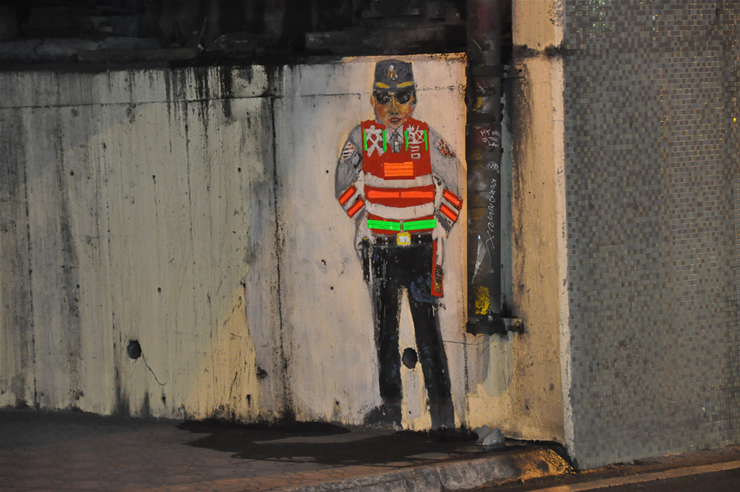 In Taiwan they have graffiti that encourages compliance with the law. Love the use of reflective tape to catch headlights of approaching cars. 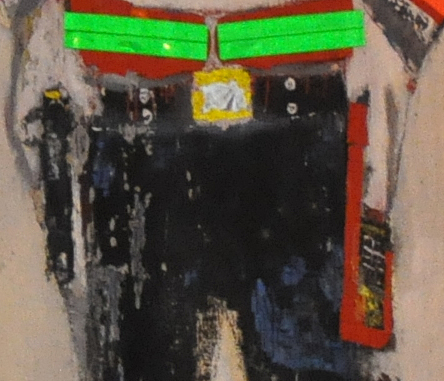 What’s he got in the other holster, outlined in red? Principal, I just tried posting something, I like your lanterns, but I can’t get it to accept me as a commenter. I’ll try again later (I’ve had this sort of problem before, I don’t think it’s you). I think it is the luminous thingy they hold up to communicate their instructions to the traffic. Posted a test on principal’s blog via my Google profile, no problem. Oh, it may well be me, AJP. I only put it up for friends and family so I wouldn’t have to repeat myself all the time, and they don’t comment. You’re the first reader I know of who I haven’t met (and very exciting it is too). Let me check if I’ve disabled comments. Huh, pinhut just tried, thanks. Maybe it only likes Google users. No, anyone registered it says. That’s a lovely piece under the bridge, Pin. There are all sorts of potential uses for reflectors. Art or Graffiti — is it always in the eye of the beholder? It’s harder to make the same argument against graffiti in Guatemala, for example, because many businesses paint their walls in a similar way, it’s cheaper than signage, after all, while Mexico has a strong mural tradition, etc. Slightly too big for my template, but here are some cute examples from a single small town, Santa Maria de Jesus, Sacatepequez, (Guate) including one for a pinchazo where somebody cocked up the stencil. Shop Crown and save, Save Crown and shop, something like that. Yes it’s the family motto. TOM, I’ve been missing you! I’ll have to come round to your blog. The last I heard you were bitten by a dog, I do hope you’re better. I don’t care about which party either, I just don’t think it’s healthy with that sort of majority. But that’s a sidenote with little relevance to the harey question. I’d really like them to cut through the crap and keep that hare, but crap may be a a tough matter to cut. I don’t know. But whatever the reason for the decision, and whoever made it, I’m pretty sure it wasn’t about the art, and whatever reason they’d find to allow it now, it would be about the art. I’d be OK with that, though. Well, why the hell not? We’re going to have an extra million unemployed, they have to do something. Rather than that wheeze of, was it Keynes? of paying one bunch of men to dig holes and another to fill them up, why not designate some Urban Art Zone and bless the damned thing, put an incentive in place to attract young people with creativity (ie: most of them, in my experience) and watch it bloom. The one thing the UK has never ever run short of is the capacity to generate new cultural movements seemingly out of thin air (okay, maybe air infused with marijuana), why fight it? Anyway, on Norway, AJ, and Trond (are you there? ), did you catch the Thinking Allowed podcast on the research a guy did on drug dealing in, I think, Oslo? Was stimulating. I might too, but I don’t think they will. 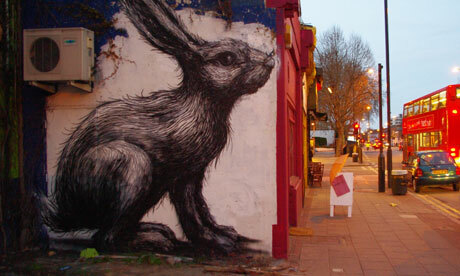 Hackney council already destroyed a well-known Banksy mural because they classified it as “graffiti”. They’re just incompetent idiots who are a disgrace to the East End. They deserve to live in a place with no art. As to Hackney council, words simply fail me. In Canada murals are very common on otherwise large bare walls. Those murals are sometimes commissioned by a city or business and sometimes done spontaneously by local people. Here in Halifax, where there is a well-known art college, we get plenty of this street art. In many cases, in places which are likely to attract random graffiti (for instance on a temporary fence made of plywood sheets around a construction site), artists (including art students or even schoolchildern) are encouraged to paint them as they like, each one reserving a space for the purpose. Of course, the degree of artistry is quite variable, but the young artists get practice and exposure, the public can enjoy the colourfulness of the temporary outdoor exhibition if nothing else, and the custom does cut down on graffiti and random vandalism since it provides an outlet for creative protest or controversy if that is an artist’s intention. Thanks for the links, Bruessel. Here’s another for ROA. I did a big mural in a housing estate in Peckham (London) while I was in art school. It’s very good practice, working that big.